Detailed demographic, socio-economic survey of the adopted villages of different Panchyats of district Hamirpur for proposed activities. Identification of concerned government departments for finding the solution of the problems, needs and requirements of these adopted Gram Panchayats. 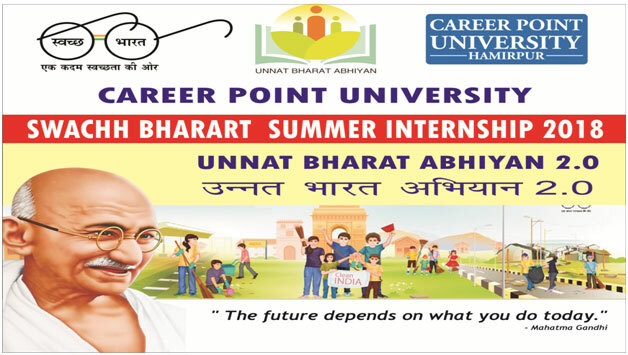 Enhancing understanding between the University and village community with support of University bodies like Community Development Cell, National Service Scheme, and Swachh Bharat Summer Internship Programme 2018. Evaluation and assessment of the various Government schemes being implemented in the adopted Gram Panchayats with the support and coordination of district authorities. Awareness camps for water management, water safety. Awareness about natural ponds and their cleanliness from weeds and Cleanliness campaign by students to clean the ponds. Awareness and cleanness of natural water resources like step well, wells etc. Awareness and use of twin bin system in each home and waste management and recycling and revising. Placement of Garbage bins in the village. Proposed plan for the Bhiar and Kot villages under the Gram Panchayat Mehal. Construction of the pacca road from Kot to main road to be taken up with the PWD department. Construction of water tank for conserving water from the natural spring. Solar light in public places in the village. Promotion and development of Agriculture and horticulture to sustain village economy. Awareness Campaigns about cleanliness at their homes and nearby surroundings. To provide improved crops, seeds suitable for less fertilized areas to increase production. Proposed plan for the Dungrin village under the Gram Panchayat Sadhrian. Construction of Angaanwadi Bhawan to be taken up with the district authorities. Construction of proper sewage and sanitary system from each household to be taken up by the Gram Panchayat. Solar light in public places. Proposed plan for the Tikker village under the Gram Panchayat Kharwar. Issue of Solar lights in village to be taken up by Gram Panchayat. Issue of Pacca Road Construction to be taken up with the PWD department. Issue of Hand pumps in village to be taken up by Gram Panchayat. Solar light in public places to be taken up by Gram Panchayat. Issue of Road connectivity to be taken up by Gram Panchayat. Four other projects are in process.